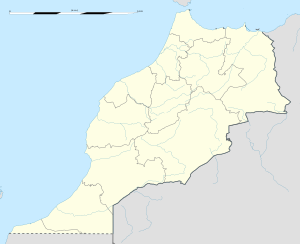 Khémisset (Arabic: الخميسات‎; Berber leids: ⵅⴻⵎⵉⵙⵙⴻⵜ) is a ceety in Morocco, population 111,971 (2008 census). It is situatit on the A2 motorwa atween Rabat (81 km) an Meknès (57 km), an is the caipital o the province Zemmour. The French built in 1912 - 1914 a 600 mm narrow gauge railway frae Rabat via Souk el Abra des Sehoul, Tiflet, Dar Caid Bou Driss tae Khemissit. It wis abandoned in 1935 an liftit afore 1942. Atween Tiflet, an Khemessit the auld track bed o narrow gauge line wis later built tae Rabat Khemissed main road. The 18 o November Stadium haes a capacity o 10,000 an hosts the hame games o Ittihad Khémisset. A synthetic grass pitch wis be instawed in 2011.